Rheumatoid arthritis (RA) is a chronic and progressive inflammatory disorder primarily affecting the synovium. We now recognise that conventional radiographic images show changes of rheumatoid arthritis long after irreversible joint damage has occured. With the advent of powerful disease-modifying drugs, there is a need for early demonstration of rheumatoid arthritis and a need to monitor progress of the disease and response to therapy. 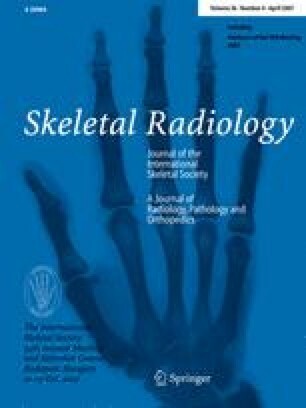 Advanced imaging techniques such as ultrasound and MRI have focussed on the demonstration and quantification of synovitis and erosions and allow early diagnosis of RA. The technology to quantify synovitis and erosions is developing rapidly and now allows change in disease activity to be assessed. However, problems undoubtedly exist in quantification techniques, and this review serves to highlight them. Much of the literature on advanced imaging in RA appears in rheumatological journals and may not be familiar to radiologists. This review article aims to increase the awareness of radiologists about this field and to encourage them to participate and contribute to the ongoing development of these modalities. Without this collaboration, it is unlikely that these modalities will reach their full potential in the field of rheumatological imaging. This review is in two parts. The first part addresses synovitis imaging. The second part will look at advanced imaging of erosions in RA. Part 2 of this article (Erosions) can be found at http://dx.doi.org/10.1007/s00256-006-0220-3.